(Positive Med) The medical definition of referred pain means a type of pain in certain parts of the body caused due to the problems in vital organs. It is very important for an individual to understand what type of referred pain they felt and its meaning. Because referred pain can point out to some serious problems in your body, you must see a doctor whenever you feel any such pain. Even the minor pain in your shoulder can be a significant symptom as well. Here is a list of referred pain and how would you recognize it. Mild to intense pain in the chest area and left arm indicate that the person has a cardiac problem or heart disease. Because heart ventricles send signals in the form of impulses to the same levels of the spinal cord, a person with the cardiac problem often feels pain in these areas. Those who experience such pain should immediately visit their physician for a further checkup. Based on the patient’s condition and severity of the heart disease, doctors will prescribe medication and suggest further treatment plans. A person with pain in the shoulder and upper neck area should see a pulmonologist because such pain indicates that there is some issue with the lungs. If the individual has breathing problems, lingering pain around the neck and heavy pain in the shoulder, then visiting the doctor is highly advised. Because of the problem in the respiratory system, the phrenic nerve joining the spines often sends impulses and causes the pain. Massage and gentle pressure around the neck and shoulder will alleviate the pain temporarily. While the problems in the lungs result in pain in the front of the neck, liver, and gall bladder problems result in the pain in upper shoulder areas and below the right rib cage. Such pain can be a result of any serious condition with the liver or gallbladder. If the pain felt lasts for a longer period of time, you should see a doctor immediately. This pain also occurs due to the nervous impulse sent from the diaphragm connected to the phrenic nerves. Most of the time physicians prescribe an analgesic drug to treat such pain. Plus, radio imaging and other diagnostic procedures are required to find the real problems in the liver and gall bladder. Since muscle spasm is the cause of pain, in this case, gentle massage that improves circulation really helps. Such pain indicates that the person has problems in the stomach and pancreas. This is one of the most difficult referred pains to be identified. This is because most of the time a person thinks the cause of front and back pain is due to wrong posture, sprain and sedentary lifestyle. Because most of the people with such pain fail to recognize it, the problems in stomach and gall bladder often worsen over the period of time. See your doctor diagnose the problem and find the right treatment for your stomach or pancreas disease. Changes in diet, regular exercises, and detox food helps in the betterment of the condition of the pancreas and stomach disease. Such pain indicates that the person has a problem in the small Intestine. Most of the time, the person feels pain in the belly button area. Any minor to severe inflammation in the small intestine can also lead to such pain too. A Person may experience this pain due to any functional disorder in the intestine or because of intestinal spasm. Specific pain in the middle-lower abdomen can also refer to some problems in the colon and appendix. These symptoms are vital and require immediate medical attention. If the condition is not severe after the detailed diagnosis, such problem can be cured by a holistic diet and moderate exercise regimen. Specific pain in the middle-lower abdomen can also refer to some problems in the colon and appendix. These symptoms are vital and require immediate medical attention. Kidney disorders often result in mild to severe pain the upper leg area, pelvis and lower abdomen. Pain in the lower pelvis may indicate problems in the urinary bladder. When the kidneys are swollen or bladder is ill, it results in inflammation and sends out the nervous impulse to specific areas. Pain in the lower pelvis may indicate problems in the urinary bladder. Any problem in the ovaries can lead to such pain in both sides of the abdomen. Ovarian cysts, cancerous growth or tumor may cause such pain. Even a minor infection can cause sharp and stabbing pain in these areas. Check with your gynecologist for diagnosis and treatment. 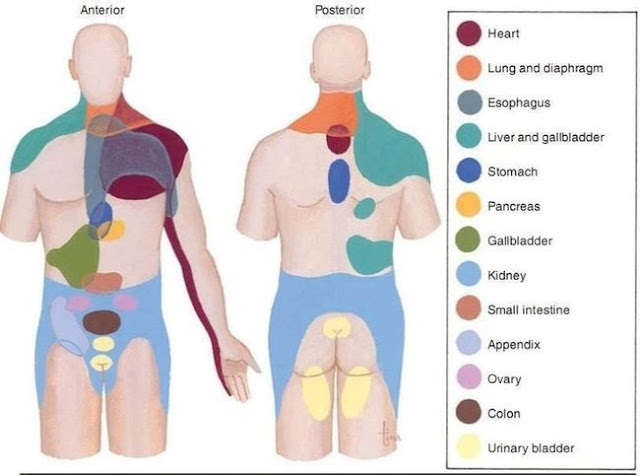 By identifying referred pain on time, you may save your life. Because these pains indicate problems in vital organs and body parts, early diagnosis and treatment can help curing the underlying disease. Every individual should learn about referred pain and the differences between common pain and referred pain. This article was republished from positivemed.com.